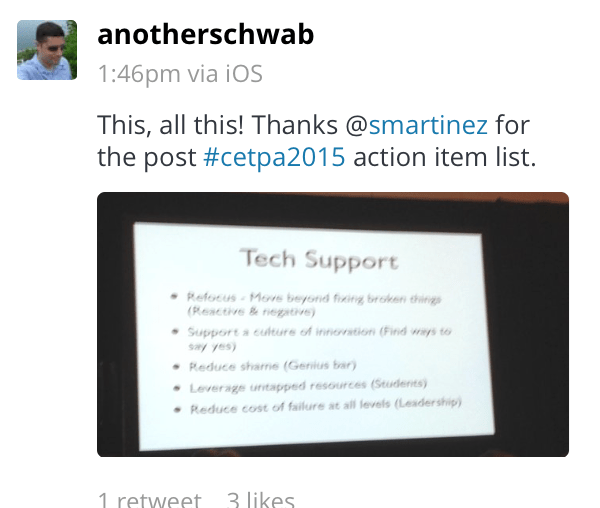 I had the opportunity to be the closing keynote for CETPA, an organization of K-20 education technology professionals in California. There were a lot of sessions about tech support, networks, and infrastructure, but it was great to see a lot of attention paid to the fact that education is the primary job of schools. I shared some of the exciting new things happening in schools in California and around the world using technology and tools from the maker movement. But for those people who work hard to keep existing school networks and technology viable in times of zeroed out budgets, it’s not good enough to just toss more technology into classrooms without considering who will support it. In the article, Forrester Research is quoted as saying that large corporations typically employ one support person for every 50 PCs, at a cost of $1420 per computer, per year. According to this model, a school district with 1,000 PCs would need a staff of 20 and an annual tech-support budget of $1.4 million. Yeah, go ahead, laugh! Everyone in a school knows this is ludicrous! Center for Educational Leadership and Technology says that some larger school districts are approaching a ratio of one IT person for every 1,500 computers or more. I think that may even be low. This creates an untenable climate in schools where tech support professionals are put in a lose-lose situation. They are responsible for everything that plugs in from the payroll system to the network to the student devices. There is no way to make an impossible situation work without being a constant state of vigilant triage. It’s common – and not unreasonable to develop a circle-the-wagons mentality where blame and finger-pointing is rampant. And the blame goes all around – teachers are slackers, students are hackers, admin is clueless – and comes right back at the tech support team. They become network nazis, the department of no, and worse. Innovation is unsustainable in this kind of atmosphere, even with the most compelling ideas and plans. So how can we move forward? This is the “to do” list I proposed. I believe that these goals are not only useful for schools with plans for innovative technology, but can create a synergy that actually is more than the sum of its parts. Collaboration between tech support, students, and teachers, creates a more trusting climate at the same time as leveraging student time and energy. Leadership that supports innovation, even when the road is bumpy, creates trust, which in turn increases responsible behavior. I believe that every person in a school is an important part of making education better!